The U.S. Coast Guard says it is investigating the contents of a video that depicts trainees operating on live goats. The private contractor that a watchdog group says administered the exercise has previously violated Agriculture Department animal research protocol, documents show. The video, an undated, undercover recording of a Coast Guard live-tissue training medical course in Virginia Beach, Va., where participants appear to chop off goats’ limbs with tree trimmers and remove internal organs with scalpels, has been gathering steam since People for the Ethical Treatment of Animals released it online April 18. 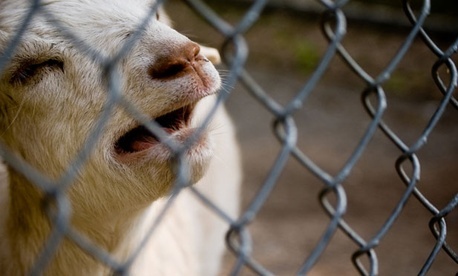 In the video, goats can be heard moaning while training participants call for “another bump” of anesthesia. The exercise is part of the Coast Guard’s combat lifesaver training, used to simulate battlefield care for medical personnel prior to deployment in the Patrol Forces Southwest Asia region, which includes Iraq and Afghanistan. PETA said the exercises are conducted by Tier 1 Group, a private contractor specializing in military training with an active USDA license and registration to perform animal research, and a larger contractor assigned the training to Tier 1 Group. The Coast Guard was unable to comment on the exact relationship between the contractor and the exercises due to the nature of its ongoing investigation, and the Defense Department, which also retains the company to administer training sessions, would only say on the subject that Tier 1 Group is “an approved contractor.” Tier 1 Group could not be reached for comment. A USDA investigation of Tier 1 Group in August 2011 found two indirect animal research protocol violations in the group’s training exercises. The report found the contractor was using inappropriate anesthetic agents on its goats and was insufficiently monitoring them. A spokeswoman for USDA’s Eastern Region Animal Care Office, which includes Virginia Beach, said license holders are required to submit annual reports, due every year on Jan. 1, about animals that have suffered pain as a result of research practices. USDA agents also investigate cases where anonymous complaints have been filed. The spokeswoman added private military contractors do not receive preferential treatment in inspection procedures. PETA Laboratory Methods Specialist Shalin Gala, along with 11 military and medical experts, wrote a letter to Defense Secretary Leon Panetta and Coast Guard Commandant Adm. Robert Papp on April 18 asking that the training exercises be investigated. On May 30, Frank Kendall, Defense acting undersecretary for acquisition, technology and logistics, replied to Gala, affirming the department’s goal to reduce animal testing to a minimum and to treat animals “humanely,” while asserting that combat medical training is crucial to saving lives overseas. The letter didn’t stop PETA from releasing another video the following day in which Oscar-winning writer and director Oliver Stone, who earned a Bronze Star and a Purple Heart with an oak leaf cluster after serving the Army in the Vietnam War, pleads for Defense and the Homeland Security Department to halt the training practice. Cmdr. Chris O’Neil, chief of media relations, told Government Executive that the Coast Guard is investigating the contents of the video. Five hundred and fourteen Coast Guard members have attended the training sessions since 2009, according to O’Neil. He added some units accessed Tier 1 Group directly through the General Services Administration, as the contractor is on the agency’s schedule, and there are other providers of combat lifesaver training, including the Army’s Program Executive Office for Simulation, Training and Instrumentation. Kathy Guillermo, vice president of laboratory investigations for PETA, said a whistleblower delivered the video anonymously to the organization’s office, and they were able to confirm independently that it features Coast Guard service members. PETA edited the video before posting online and no longer has access to the original, according to Guillermo. Guillermo, who learned of the pending investigation separately, said the Coast Guard’s response to the video “seems to be very much in line.” She said PETA would not direct its efforts toward Tier 1 Group or other private contractors. “Our focus continues to be on the Coast Guard and on the military,” Guillermo said, adding PETA’s goal is to get Defense to “entirely” re-examine its animal testing practices. Defense spokeswoman Lt. Col. Melinda Morgan directed questions about the specific training exercise to Tier 1. She said contractor services determine the curriculum for training exercises and are responsible for adhering to approved animal-use protocol. Morgan also reaffirmed the use of animals for combat medical training. Branches of the military use similar methods of medical training on live pigs and goats, according to the Associated Press. Despite the fact that the military is increasingly substituting animals for lifelike human models in training situations, Morgan said animals remain the best tool for trauma training. A House bill “to require the secretary of Defense to use only human-based methods for training members of the Armed Forces in the treatment of severe combat and chemical and biological injuries,” sponsored by Rep. Bob Filner, D-Calif., has languished in Congress and was last referred to the House Armed Forces Subcommittee on Military Personnel in February 2011, according to the Library of Congress online database.